Choosing the right flow cytometry antibodies could be described as an art. You walk the line of balancing epitope expression and fluorochrome brightness to build the most agreeable panel for your application of interest. The relevance of panel design continues to increase as scientists explore further often to fully utilize their instrument’s available channels of fluorescent detection. As a cytometry specialist, I often encounter misconceptions when working in the field. Assumptions are made about excitation/emission patterns that can be very problematic. For example, using a 488 nm laser to excite PerCP-Cy™ 5.5 and working with a spatially separated laser configuration, a user might assume they will only detect light in channels associated with the 488 nm excitation ranges. This is actually false as this protein is excited by the 635 nm laser and is shown in the figure below. Let’s say you look at a cell that is positive for PerCP-Cy5.5 and positive for a dimly expressed protein via APC. 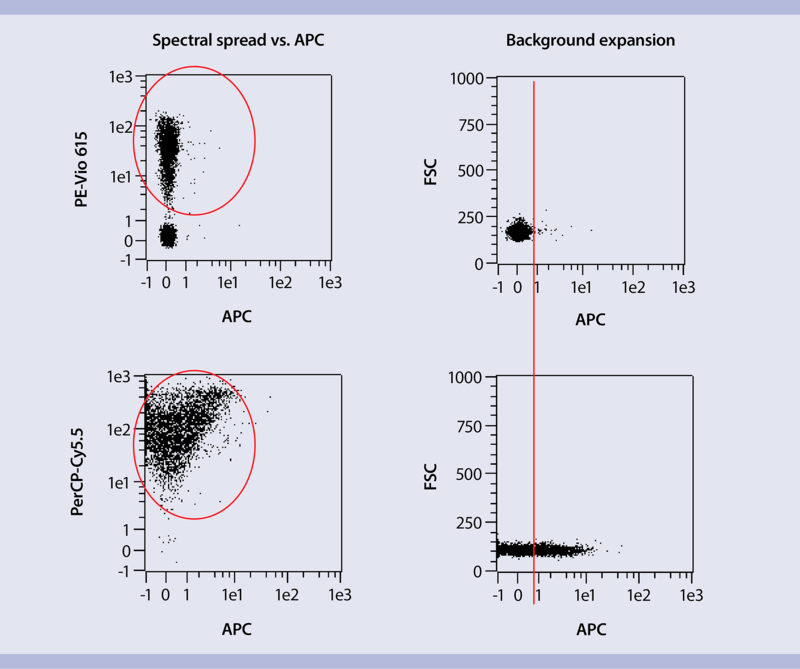 You are going to be challenged to detect the dimly expressed APC protein due to the background expansion caused by the PerCP-Cy5.5 on that cell. As a solution, I would like to highlight a new tandem conjugate Miltenyi Biotec offers called PE-Vio® 615. 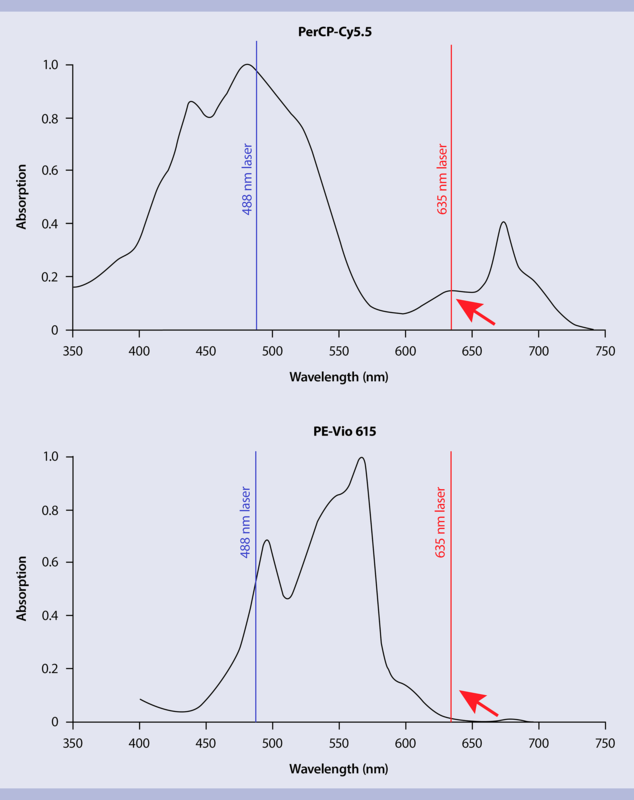 In our MACSQuant® Analyzer 10, both conjugates are detected in the B3 channel with the filter set from 655–730 nm of light excited by the 488 nm laser. The figure below demonstrates the compensation/spectral spread comparsion of PE-Vio 615 vs. PerCP-Cy5.5 and the background expansion effects each fluor has on APC. The figure demonstrates the compensation/spectral spread comparsion of PE-Vio 615 vs. PerCP-Cy5.5 and the background expansion effects each fluor has on APC. As you can see the sensitivity of the APC channel is not heavily impacted by PE-Vio 615 and provides a more flexible alternative to PerCP-Cy5.5. This point is often overlooked in panel design and can be especially challenging for new flow cytometrists. Visit our Website or reach out to our technical support.